Currently we’re using flexmonster for our reporting dashboard in the front end. 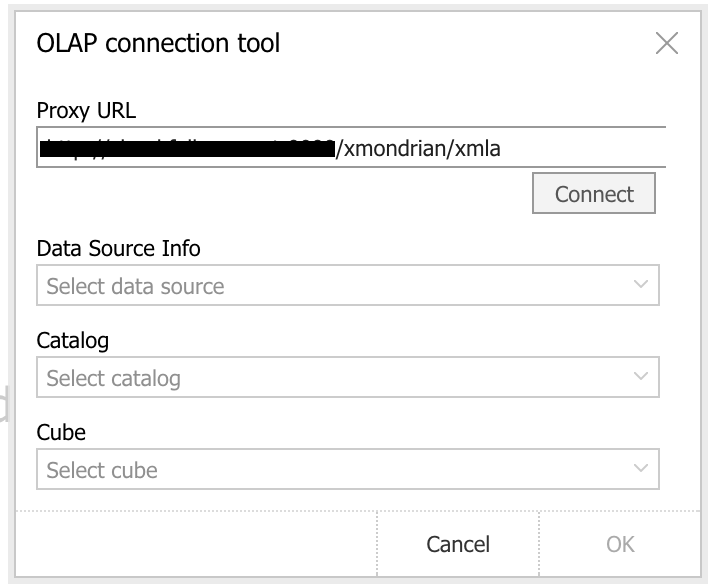 As for the backend we’re using mondrian for the OLAP server. We’ve managed to make connection from flexmonster to our OLAP server for the first time, but when we’re try to connect it for the second time on the same chart, it fail. We’ve check on console debugging, it appears as the attached file given. We’ve already add the ‘Access-Control-Allow-Origin’ on our tomcat server, but the problem still occured. For temporary solution, we have to refresh our page in order to make a new connection to our OLAP server. Is there anyway to solve this problem beside using flexmonster’s proxy? Thank you for your question. Could you please confirm that you faced the same issue which is described in the video – https://www.screencast.com/t/uUuzkG33ke ? Probably the same, but mine is fail as soon as click the ‘connect’ button at the Proxy URL textfield. The data source info, catalog and cube dropdown are even disabled like the connection is not successfully established. Thank you for the explanation. We have not managed to reproduce the issue on our side. Please provide us with some additional information. Does the issue reproduce with our site demo? Also, is it possible to give us access to your sample data? It would help us to detect the issue. OK, can you provide us your email so we can send it there? Thank you for providing the data source. We were able to reproduce the issue on our side. The fix will be ready in the version 2.314 ETA Apr 24. As a temporary workaround, we suggest using flexmonster.clear() before each new connection to OLAP server. I am glad to inform you that the minor release 2.314 is available for download now. The issue with failed second connection to OLAP server was fixed. You are welcome to update the component.